The Laser Directed Site & Satellite Finder Kit consists of: Sighting INOGON with SILVA 80 Sighting Compass, Laser Projector, Reflective Antenna Face Target, 250mm (10") Magnetic Base, Dish Clamp and Compact Tripod. Comes in a protective case. 4mW, Class IIIA Laser powered by one 3 volt Lithium Cell (CR123A) for 20 hours continuous use. 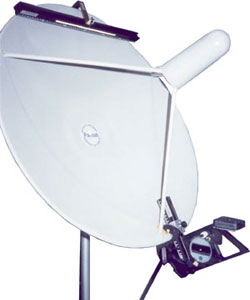 Adapts on 0.3 - 18m dish. Laser point indicates the signal and can be seen up to 45m (150ft) in shade and up to 300m (1000ft) in darkness. Reads AZ-EL simultaneously. Super accurate to measure size of the satellite signal through narrow hole or opening. Made for the traveling surveyor and installer.